If using classic crust: Heat oven to 425°F. Sprinkle cornmeal on 12-inch square pizza stone. Unroll dough on pizza stone. Starting at center, press dough into 12-inch square, forming 1/2-inch rim. If using thin crust: Heat oven to 400°F. Spray or grease 15x10-inch or larger dark or nonstick cookie sheet. Sprinkle cornmeal on cookie sheet. Unroll dough on cookie sheet. Starting at center, press dough into 15x10-inch rectangle. Spread pizza sauce over crust to within 1/2 inch of edges. Top with pepperoni and mozzarella cheese. Sprinkle with Parmesan cheese. Bake classic crust 14 to 18 minutes, thin crust 8 to 12 minutes, or until crust is golden brown. Cut into 4 servings. Pile on your favorite toppings, such as cooked Italian sausage, chopped onions and bell pepper, to make a great pizza even better. Pepperoni is by far America’s favorite pizza topping. 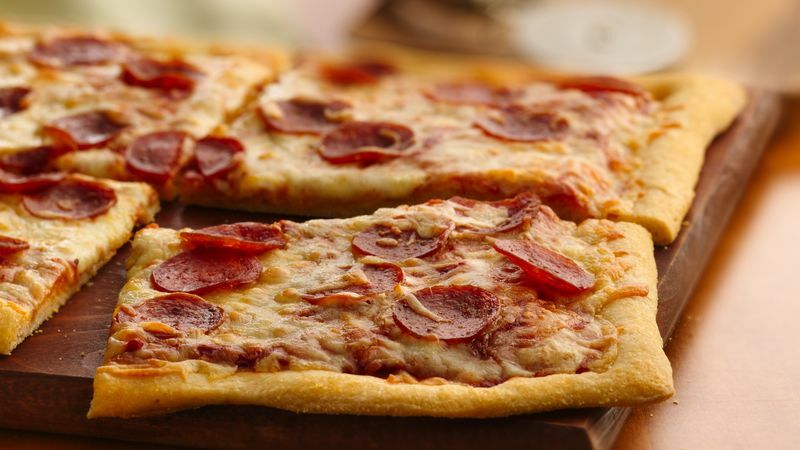 Though pizza was originally invented in Italy, pepperoni as a topping wasn’t. That’s right—pepperoni pizza is an American creation. According to this New York Times article, the first reference to pepperoni in print was in 1919, when pizzerias and Italian butcher shops began to flourish in America. Now, you’d be hard-pressed to find a pizzeria in the United States that doesn’t offer pepperoni pizza. You don’t have to go to a pizzeria to enjoy a slice of this classic dish, though. Pepperoni is widely available at grocery stores, and with a few additional basic ingredients like pizza sauce, mozzarella, Parmesan and Pillsbury pizza crust, you can have a whole pepperoni pizza on the table in less than 30 minutes. Trust us, this is the easiest pepperoni pizza recipe out there. Pepperoni pizza is just the beginning! Learn how to make all kinds of different pizzas at home and browse all of our easy pizza recipes.